Today is the European Day of Languages. This day is celebrated annually and focuses on linguistic diversity in Europe and promoting language learning. To honour this day, we interviewed Professor Ghil’ad Zuckermann, Chair of Linguistics and Endangered Languages at the University of Adelaide, to discuss the importance of linguistic diversity, his favourite European languages, and why learning another language makes you smarter. Q: The European Day of Languages encourages language learning for young and old. Why is it so important to learn other languages? Ghil’ad Zuckermann: Firstly, there are fascinating and multifaceted cognitive, cultural and health benefits to multilingualism. Studies have found that native bilingual people, those who speak two languages as their mother tongues, have better non-linguistic cognitive abilities compared with monolingual people: For example, native bilinguals suffer from dementia approximately 4.5 years after monolinguals. Agnes Melinda Kovács and my friend Jacques Mehler (2009) conducted three eye-tracking studies and found that 7 month-old babies reared with two languages from birth display improved cognitive control abilities compared with matched monolinguals. Jen Krizman and others (2012) researched attention and auditory processing and found that the bilingual’s ‘enhanced experience with sound results in an auditory system that is highly efficient, flexible and focused in its automatic sound processing, especially in challenging or novel listening conditions’. Q: Europe is rich in linguistic diversity, what are some of your favourite European languages and why? Ghil’ad Zuckermann: I love Italian for bel canto opera. I love Yiddish for psycho-ostensive expressions. I love Welsh, Icelandic, Faroese and Greenlandic for the sound of the voiceless alveolar lateral fricative as in Welsh Lloyd. I love Hungarian for its word for scissors, which serendipitously looks like scissors: olló. I love Israeli (Reclaimed Hebrew) my first mother tongue, for its Arabic curses. Obiter dictum, Israeli is in my view a Semito-European hybrid language, because it is based simultaneously on Yiddish, which is European, Hebrew, which is Semitic, and a plethora of other European and non-European languages spoken by the fin-de-siècle Hebrew revivalists. Q: There are more than 200 languages in Europe, what makes language diversity so important? However, as you know, with globalization, homogenization and Coca-colonization there will be more and more groups added to the forlorn club of the powerless lost-heritage peoples. Although there are approximately 7,000 languages currently spoken worldwide, 96% of the world’s population speaks only 4% of the world’s languages. Language is much more important than land. But we are losing dozens of languages every year. Interested in hearing more from Ghil’ad Zuckermann? 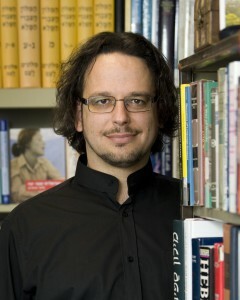 Professor Ghil‘ad Zuckermann (DPhil Oxford; PhD Cambridge, titular) is Chair of Linguistics and Endangered Languages at the University of Adelaide. He is a chief investigator in a large research project assessing language revival and mental health, funded by Australia’s National Health and Medical Research Council (NHMRC). This entry was posted in AdelaideX, Language Revival, Massive open online courses, Q&A and tagged AdelaideX, EDL, European Day of Langugages, Ghilad Zuckermann, Language diversity, language revivial, learning another language, MOOCs, University of Adelaide. Bookmark the permalink.